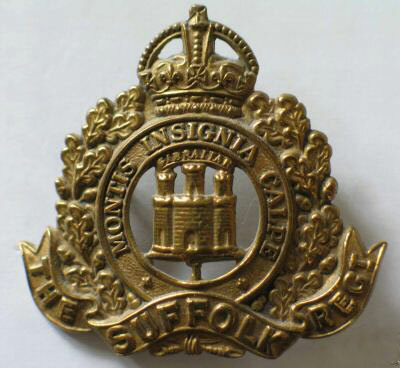 At the outbreak of war in August 1914 the 1st Battalion Suffolk Regiment were in the heat of Khartoum, in Sudan but by mid-January 1915 the men of the Battalion had travelled to Merris in northern France to face the contrasting conditions of a damp and raw winter. As 1915 began the trenches of the Western Front were often frost covered banks of mud collapsing into water filled ditches. There were no major battles recognised, just constant sniping, shelling and machine gunning, often with face to face contact, as one side attempted to overrun the others trenches. Enduring these conditions were the following Hadleigh men; Private (8240) Ernest Harry Chisnall and Private (8118) Albert Seager, both from Benton Street and also Private (7077) Harry Ramplin from New Cut. At Merris the men of the Battalion went through their final training for trench warfare, which generally began each morning with a 9 mile route march. A test for the men as well as their boots! The war diary tells that the boots issued before embarkation from England proved to be of “an inferior quality” and “were falling to pieces”, getting beyond the Battalion’s shoemaker’s resources to repair. The horses were suffering the bitter cold and on 24th of January, twenty four were sick with pneumonia. All the horses were then given an extra horse rug. Thirty three men also reported sick that day. On 2nd of February the Battalion, consisting of 24 officers and 893 other ranks, were transported towards the front line using a fleet of 38 buses. They first arrived at Vlamertinghe in Belgium and then marched the remaining one and half miles east to billets in Ypres. They were now on the Salient where they were destined to spend the next few months. During most of February the 1st Suffolks fought in appalling conditions in the Verbrandenmolen sector of trenches, about two miles to the south east of Ypres. They would spend about 2 days at a time in the front line where they saw some fierce fighting with both sides launching brutal attacks in an attempt to dislodge the other and gain ground. When the Battalion was relieved in the early hours of the 18th of February, they marched back to billets at Kruisstraat 2 miles behind the lines, the men had been standing knee-deep in icy cold water for forty-eight hours. The men’s feet were so numbed that when relieved few could get out of the trench without assistance and the march back to billets was slow and painful. The regimental history reflects that the fighting in February 1915, “though costing the Battalion eleven officers and three hundred other ranks was not of sufficient importance to be included in the official list of the battles and engagements of the Great War.” Such was the significance of this one engagement in the enormity of the Great War. Private Ramplin, whose full name was Henry Richard Ramplin, was born in 1891 the son of Frederick and Eliza of 33 New Cut. 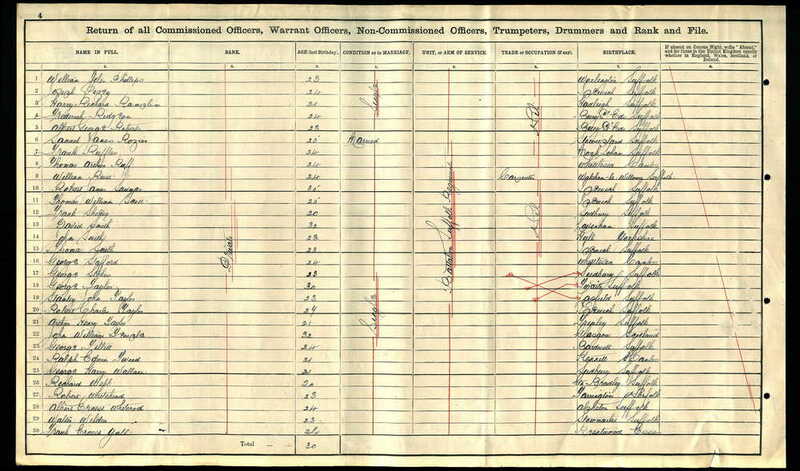 He enrolled in the Suffolk Regiment in about 1908 and saw something of the world, being around the Mediterranean at the time of the 1911 census. It is thought that he had left the army by 1914 but was still part of the Reserves and was mobilised at the start of the war and transferred to 1st Suffolks as they entered the conflict. 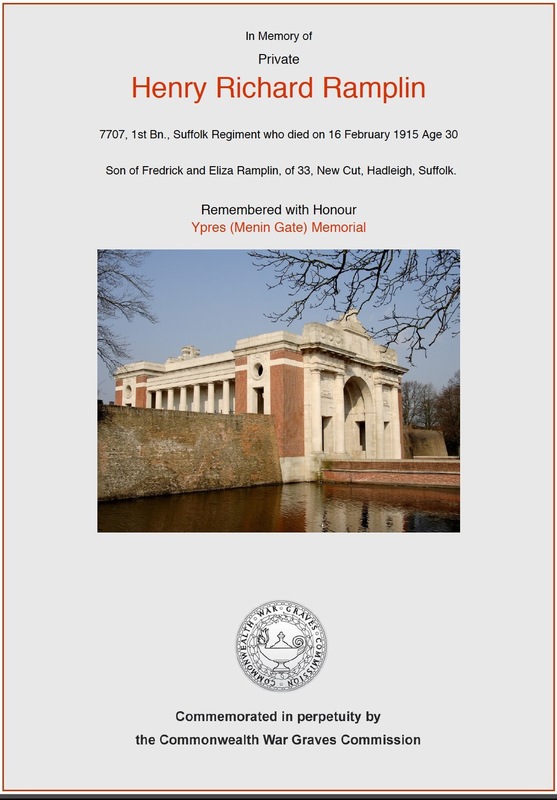 In that quagmire Private Harry Ramplin from Hadleigh was lost, listed as missing; his name remembered today on the Menin Gate Memorial at Ypres, as well as on the Hadleigh War Memorial. In fact during that one period of forty-eight hours, 197 officers and men of the 1st Suffolks were either killed or missing. 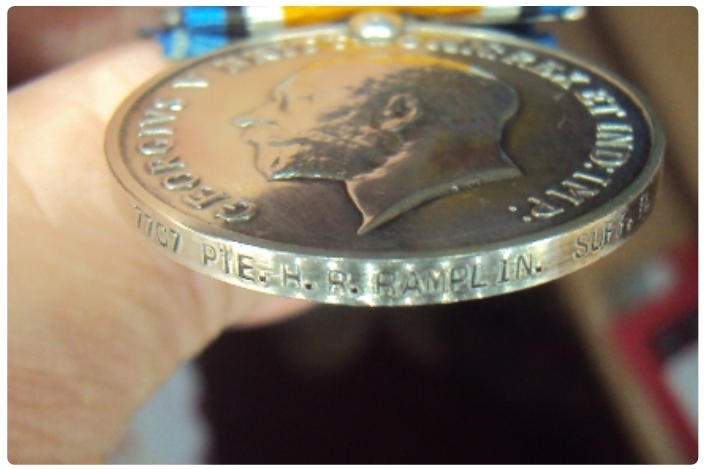 Over the years, Harry's medal were passed on to different relatives. The British War Medal shown on the left along with the Memorial Plaque are still owned by a relative living in Hadleigh. Harry was the first of three Ramplin brothers to die during the war. 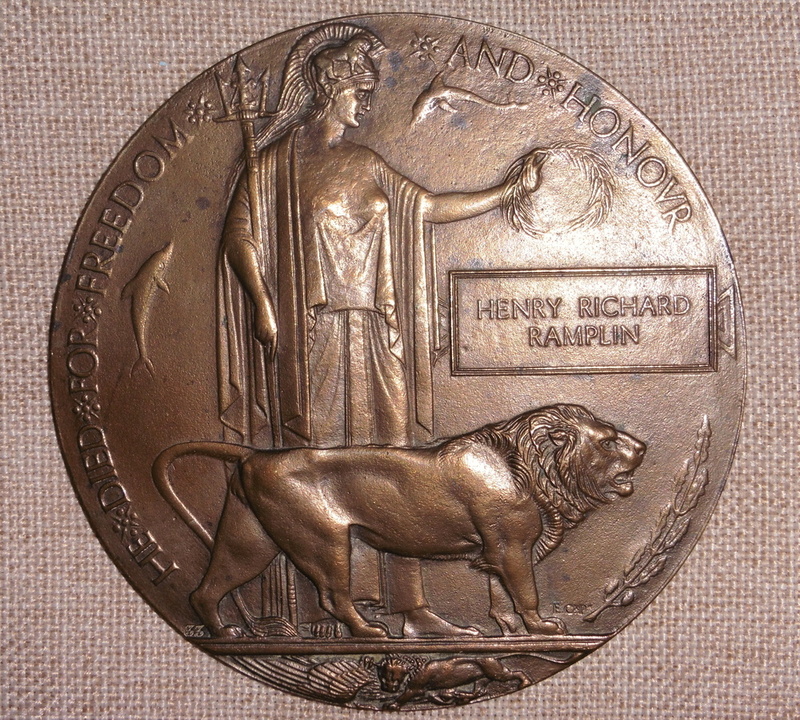 We hope that this page has been able to tell the story of Henry (Harry) Richard Ramplin. If you know of any information which might help to add to the story then please get in touch.